There is an old trick in both government and business to get rid of an operation you don’t like through stealth—you simply cut its budget gradually, thus causing its effectiveness to suffer, and then cut it some more because it is ineffective. Repeat until the operation is so weak and can be abolished altogether. Republicans have been playing this trick with the Internal Revenue Service for years. The agency has become the all-purpose whipping boy to excite Tea Party members and divert attention from the performance problems resulting directly from Congress’s failure to fund it properly. The Obama administration has stood by passively, doing nothing whatsoever to counter Republican attacks. The problems at the IRS will only get worse; the new budget gives it $526 million less than it got in 2013, which was cut from what it got in 2012, which was cut from what it got in 2011. 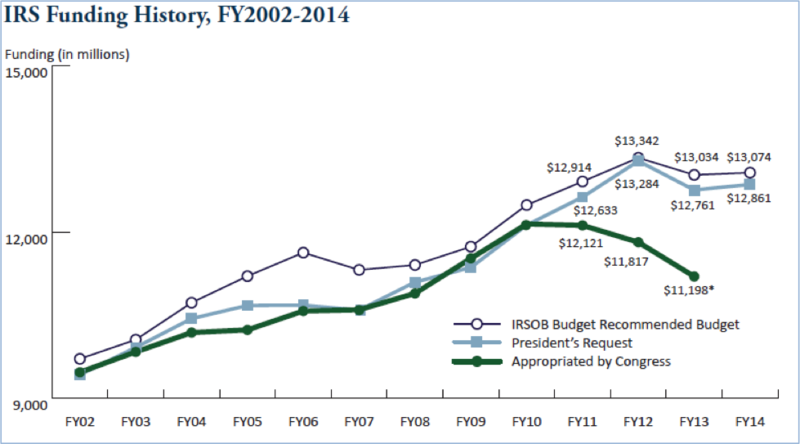 And these are dollar cuts; in inflation-adjusted terms the budget reduction is even greater. The IRS Oversight Board has repeatedly criticized Congress for failing to provide the IRS with adequate resources to do its job. The following graph shows the recent trend. Since the bulk of the IRS budget goes to personnel, budget cuts translate directly into fewer people working at the IRS. The number of positions peaked at 116,673 in 1992—after Republicans Ronald Reagan and George H.W. Bush supported steady increases from 86,156 positions in 1981—to just 87,032 in 2013. Fewer personnel necessarily mean that the IRS cannot respond to requests for information from taxpayers. According to the Taxpayer Advocate’s office, in 2013 the IRS was only able to answer 61 percent of taxpayer phone calls, down from 87 percent a decade ago, and the time people had to wait for a consultation rose from 2.6 minutes to 17.7 minutes. Moreover, on those occasions when taxpayers can reach an IRS official, they are less and less likely to get an answer to their questions about the tax law. The number of tax law questions answered by Taxpayer Assistance Centers has fallen from 795,000 in 2004 to just 110,000 in 2013, according to U.S. Government Accountability reports. This poor performance results directly from a slashing of the IRS training budget from $172 million in 2010 to just $22 million in 2013. And this was during a period when the Affordable Care Act was being implemented, which added considerably to the IRS’s responsibilities since much of it involves new tax credits and penalties. 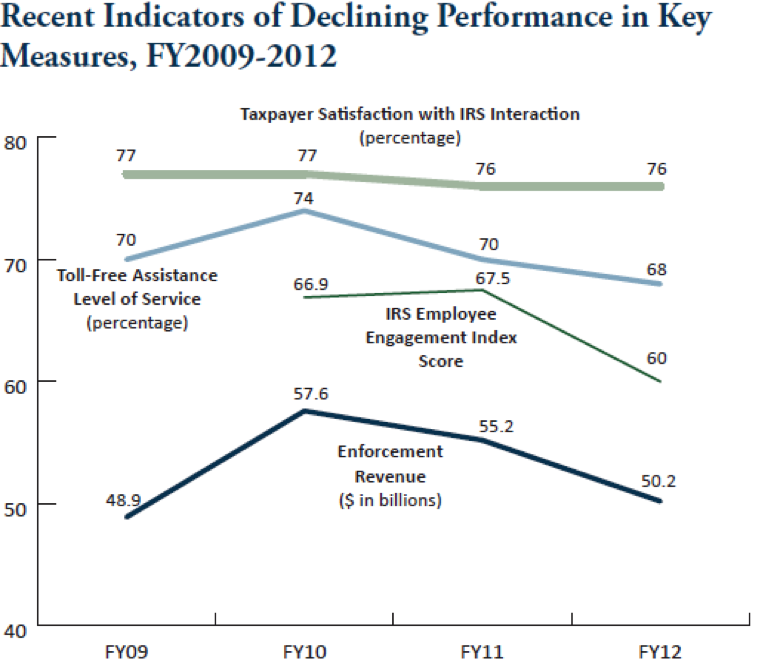 Not surprisingly, other indicators of IRS performance have also fallen, such as the number of audits and the amount of unpaid taxes collected. In the end, those who suffer most are average Americans who cannot afford expensive accountants or tax preparation software, and attempt to do their taxes honestly by themselves. Another cost, is encouraging tax evasion by otherwise honest people who feel less responsibility to be honest when the IRS doesn’t take their calls or answer their legitimate questions adequately. Experience shows that once people begin to evade taxes it tends to multiply and continue indefinitely. No one likes to think they are a shmuck for paying what they owe when their friends and neighbors brag about making up phony deductions or hiding taxable income. Eventually, the tax system will break down, as it has in many European countries, contributing heavily to the debt crisis in Greece and elsewhere. When people don’t pay the taxes they owe, this forces the government to go into debt and raise taxes on honest taxpayers, which pushes more and more of them into the ranks of the tax evaders. Another consequence is that governments must raise the sorts of taxes that are harder to avoid, which tend to be regressive sales taxes, while income taxes, which are fairer, go uncollected. Thus the overall tax system becomes less fair, which encourages further tax evasion. No one likes paying taxes, but as Justice Oliver Wendell Holmes put it, they are what we pay for civilized society. Republican scapegoating of the IRS is reprehensible and ought to end.